We can all learn about and practise leadership skills at all levels. And many of them are relevant to other non-work areas of our lives. Here are 10 reflections on leadership drawn from my experience. I hope you find them useful and I welcome any comments. 1. There are different styles of leadership and they can (nearly) all be good. The most important thing is to be yourself: know your own personality so that you can be authentic in the way you engage with other people and the way you use your authority. Understand how you as an individual can best have positive impact and influence with others and try to understand how they perceive you. Always be clear in communicating your values, what you care about and what you stand for – through your behaviour as well as your words. 2. If you want to be a leader you have to be prepared to lead. That requires self-confidence. You have to be able to judge when to listen, when to think and when to decide. When you make decisions you must be able to stick with them through adversity if you are sure they are right, and to see them through. If at some point you conclude that you were wrong, you need to be big enough to change and to explain why. The best solution is to make the right decisions! It is more important to make good decisions than fast decisions. 3. You can only lead if other people are prepared to follow. That means you have to win and retain their respect, not just for your position but for you as a person, for your experience, skills and competence. A leader has to have a strong rapport with, and understanding of, the organisation and the people he or she is leading: what they want, and what they will accept if they can’t have what they want. Emotional intelligence and intuition are important in forming these links. 4. In leadership, people and relationships are more important than tasks. The main role of a good leader is to motivate and inspire other people to do the tasks well. You need to know how to delegate and be the leader of other leaders. The leader is the conductor of the orchestra, not the first violin. But you also need to know when to step in and take responsibility. Don’t be afraid to say ‘stop’ or ‘no’ if you think things are going wrong. And don’t let other people push you into a decision which you are not comfortable with. 5. You have to set a vision. That requires a clear sense of purpose, a clear sense of direction and a clear picture of the destination. You need to be able to explain in terms that people understand and support what you want to achieve, why you want to achieve it, how you will go about it and how everyone will know when you get there. 6. Good leaders are good communicators. You have to do it all the time. It means thinking about what other people know and how they are experiencing what you are doing, especially change. It’s important to communicate in a way other people can relate to and engage with. And you have to make it easy for people to remember what you are saying: make it simple, clear and coherent. 7. Once you’ve set the vision and engaged other people through communication, you need to lead the delivery. That’s where a clear understanding of the end goal, and metrics and evaluation to demonstrate outcomes, are important. It’s a good idea to stay ahead of the delivery curve, setting interim goals along the way which are stretching but attainable. 8. It’s important to manage your energy. Leaders are constantly on display and under scrutiny. You need to have energy in reserve so that you can manage your mood and the image you project, and have something in the tank when crises happen (as they inevitably will). Learn to recognise when you are tired or stressed, and how that makes you behave. Watch out for the signs. Learn also to recognise where your positive energy comes from and what takes it away. 9. A good leader will put a lot of effort into building the right team around him or her. You need people you trust, who are on your side, who challenge and are honest with you and whose judgement you respect. You need to be able to depend on their support when the going gets tough. Being a leader can feel lonely and exposed: so you need to have your support systems in place to help you through the harder times. 10. Trust your instinct. If it doesn’t feel right, the chances are it isn’t right. I’m a great believer in the power of the subconscious, given time, to steer us to the right answers. I often prefer to have a couple of discussions before taking a difficult decision, even if that slows down the process. It helps give me certainty about what I think, and it helps the wider leadership group understand each other’s point of view and build consensus. The end result is a better decision with better buy-in. And finally………accept that we all make mistakes. Nobody is perfect. When you do, try to learn the lessons, but don’t be destabilised. Someone told me once: “don’t chew the cud”. Keep moving forward, be resilient, remember that things will get better. And smile. Not sure about 9 - A good leader will put a lot of effort into building the right team around him or her - both generally and specifically in the Civil Service given team members are, generally speaking, assigned to a particular team and the team leader has to make do with them. My point being that a leader will not always have people in the team that they want and so they need to have the skills necessary to deal with people who don't necessarily want to be in the team or need to be motivated for other reasons. I just wanted to drop you a line and let you know I've found this blog very helpful. You've summed this up really well. I feel there may be hope for me getting into SCS after all! I found this a really helpful blog. 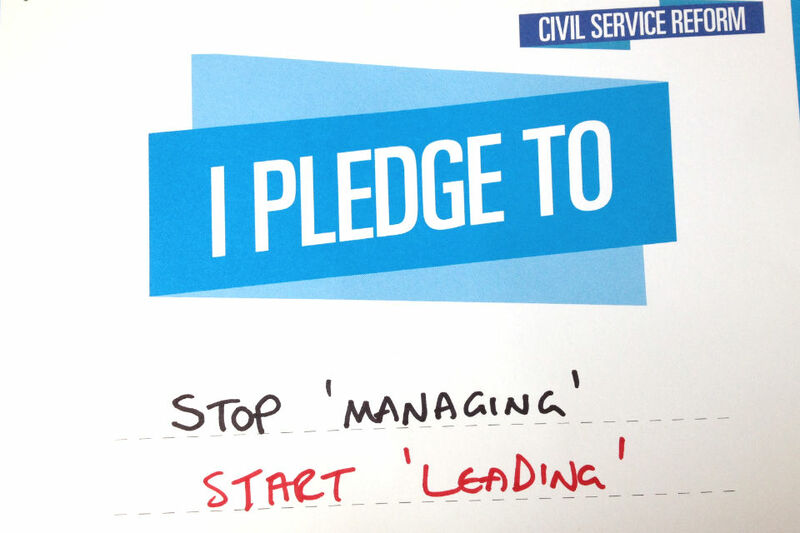 Could this become a regular fixture with reflections of other Civil Service leaders? I strongly agree with these points in particular, but I wonder about the tension with "delivering at pace", how well, if at all, can these be reconciled? "The best solution is to make the right decisions! It is more important to make good decisions than fast decisions." "I often prefer to have a couple of discussions before taking a difficult decision, even if that slows down the process." Thank you for this Simon. I will definitely have to read these 10 and even chew the cud over some of your pointers. Thanks Martin. It’s a fair point that we do not always get to choose our teams. A leader must absolutely work to enable staff to deliver their best - as I say in point 4 ‘The main role of a good leader is to motivate and inspire other people to do the tasks well’. But I do think the best leaders also look at the mix of skills, experiences and personalities they have in their teams and use that to think strategically about recruitment. 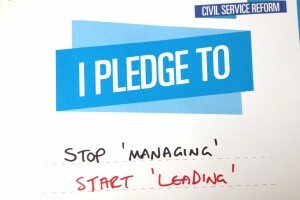 Civil Servants often move jobs regularly (especially here in the FCO), offering leaders the opportunity to try to attract the staff they need to deliver results. Thanks for feedback Sue – good luck! Hi Paula, I work for Cabinet Office Communications and can confirm that it is fine for you to use this on your intranet. It would be great if you could link back here to allow people to comment. Thanks, Cameron. Great thanks Cameron - we will link back to the blog so that people can sign up and comment. I think the notion of leadership is evolving beyond these crude characterisations at this point. We're seeing a whole new generation of thinking around leadership from all areas of society and they're starting to form new communities of practice. The Spark the Change conference http://sparkthechange.co.uk is possibly the best example of how things are changing. I agree with all the points made. The only thing I would add is that a good leader needs to take full advantages of the individual strenghs within the team so as to get the best out of them. The strengths may not always fit the business needs but where possible, try to ensure that the tasks allocated match the strengths of the individuals within the team. This will help to motivate the individuals within the team and make feel valued. Has anyone else thought that a great leader will suport his/her staff in times when they are challenged and are right? One way of earning your team's respect is to show that when things get scary, you, the team leader will take up the challenge and show support for the team. The difference between a conductor and a leader is that a conductor can play all the instruments and has an in depth knowledge of music. Civil Service Leaders do not have an in depth knowledge of the work and so they make changes or tinker without knowledge. A deadly combination.